In December of 1992 author John Barnes released the last book of his three book series 'Time Raider'. 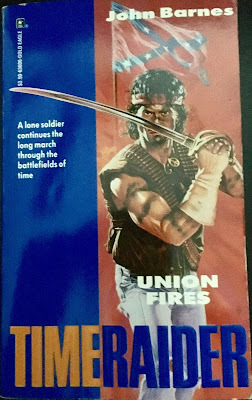 This last chapter, entitled "Union Fires", doesn't quite wrap the series up in a sufficient way to satisfy the completist like myself. The questions are still left unanswered and I'm not convinced the author had many responses. His time traveling parameters lie somewhere within the realms of reincarnation and Doctor Strange but nestled into a men's action adventure novel. However, tucked away in it's own little corner, it proves to be not only the best book of this series but one of the better books I have read in the military fiction genre. Barnes really comes into his own here and delivers a compelling thrill ride of action storytelling. The author thrusts Samson and the reader into some very intense and suspenseful situations by dropping the protagonist into Eastern Virgina in the spring of 1864. Samson, who already fought in Vietnam in his present day, has fought Nazi Germany in WWII (first book "War Tide") and struggled in the US-Mexico campaign in El Paso (second book "Battle Cry"). Shortly after his "death" in "Battle Cry" he awakens to find himself in one of the more interesting characters I've read in a long time. Samson finds that he is a double-agent that has infiltrated a small squad of Union agents. It's intricate and left me pondering throughout the book on which side Samson was currently assisting. Samson's character is Prescott Heller, a Virginia Military Institute graduate that has become an agent for the Confederacy. At some point he was sent to the north to pose as a Union soldier. He worked through the ranks and became an agent for the Union under Lafayette Baker and his secret service. 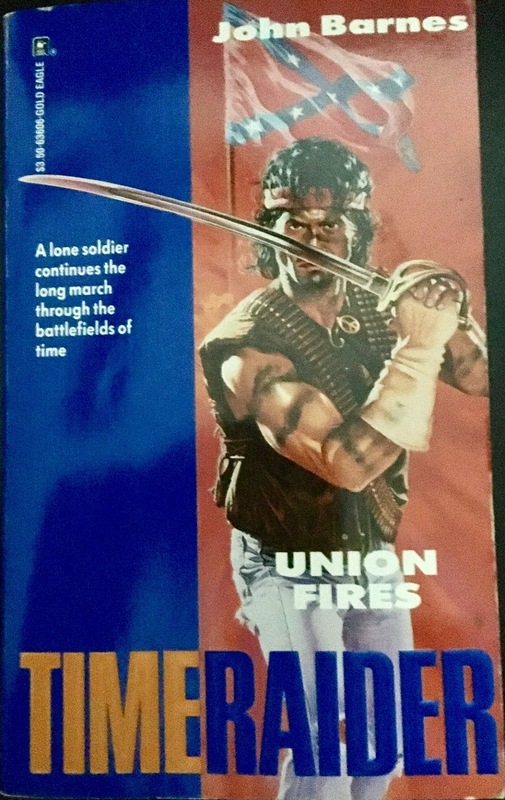 As "Union Fires" begins Samson is in a small squad of Union secret service on a mission to free northern prisoners from a tobacco plant in Richmond. As if that isn't difficult enough, Samson learns that his former wife, Sarah, in the present day is also living a past life as a Union agent as well as his best friend Matt from his own time. Sarah and Matt don't know that Samson is really Heller which makes for a unique set of circumstances. One could read this and dive right into the rather complicated aspect that Barnes is attempting here. Past lives, multiple time streams and a strange time traveling mentor that is more Master Chen Ming Kan (remember 'Kung-Fu'?) than any real help. Without dropping endless spoilers here the main premise of the book is Samson's favoritism to the Union and aborting the original mission that Heller was assigned. This leaves him in a life or death balance between reporting to Union requirements undercover and violating his Confederacy commanders who want him to stop those that mean the most to him in his current time. Barnes is quite the storyteller here and provides numerous action sequences that move this along in fast pace. The author has a good knowledge of the Civil War and provides technical details that aren't too far between the lines for casual readers. While this is an action adventure book, Barnes provides a ton of intrigue, espionage and other elements that make the spy sub-genre so much fun. The portions that feature Samson behind bars are absolutely brutal and left me contemplating my own survival in such extreme conditions. While Barnes doesn't provide the closure the series really needed he ended on a very high note. Whether there were more books planned is a mystery. In the "Afterword" section Barnes mentions that these books helped him get through a time in his life where things were collapsing. Perhaps it was his own therapy that provoked the series. Either way it leaves a decent trilogy on the table for those that love science fiction, military fiction and action-adventure. Who could ask for more than that?